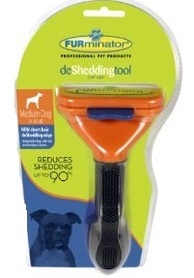 Reduces shedding up to 90 percent by removing the loose, dead undercoat without damaging the topcoat. 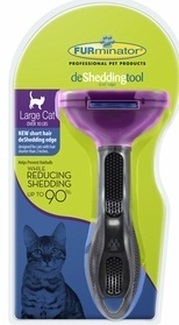 For Cats over 10 lbs and Hair shorter then 2"
Furejector button cleans and removes loose hair from the tool with the simple push of a button. Better than any brush, comb or rake, works great on all shedding, short haired cats, brings out the cat's natural oils, promoting healthier skin and a shiny topcoat reduces the amount of airborne elements that cause allergic reactions in many people. Reduces the amount of airborne elements that cause allergic reactions in many people.